Block 15 Restaurant & Brewery is located in the heart of historic downtown Corvallis, Oregon. We're serving up locally sourced casual food and super fresh craft beer, 7 days a week. Originally built in 1926 for the Gazette-Times newspaper, our building is blocks from both Oregon State University's campus and Corvallis' riverfront park. Our brewpub melds old and new, traditional and re-imagined—much like our artfully brewed beer, which is crafted on site and at our production brewery. With 16 taps and a rotating nitro option, we offer a range of Block 15 beers spanning a host of styles. Check out our tap list below to see what's available right now. We are fortunate to be situated in the midst of fertile farmland, as well as mere blocks from our local farmers' market. Our seasonal menus feature fresh ingredients, passionately grown by neighboring farmers. We serve a rotating offering of cask-conditioned ale, pulled from our temperature controlled cellar by a beer engine. Presented in authentic 20oz pint glasses, stamped by the British government. Hang out in our game room and enjoy a round of darts or shuffleboard, take in a Beaver game, or watch our brewers crank out beer in our 7bbl brewpub brewhouse. Looking to reserve the game room for a party? Hit us up! At Block 15, we believe in Proper Glassware and Proper Pours. This means that not only will your beer be served in a glass designed to maximize its flavor, aroma, and drinkability—you’ll also receive the full amount of beer you ordered, including space for a creamy head on top where the beer style warrants it. 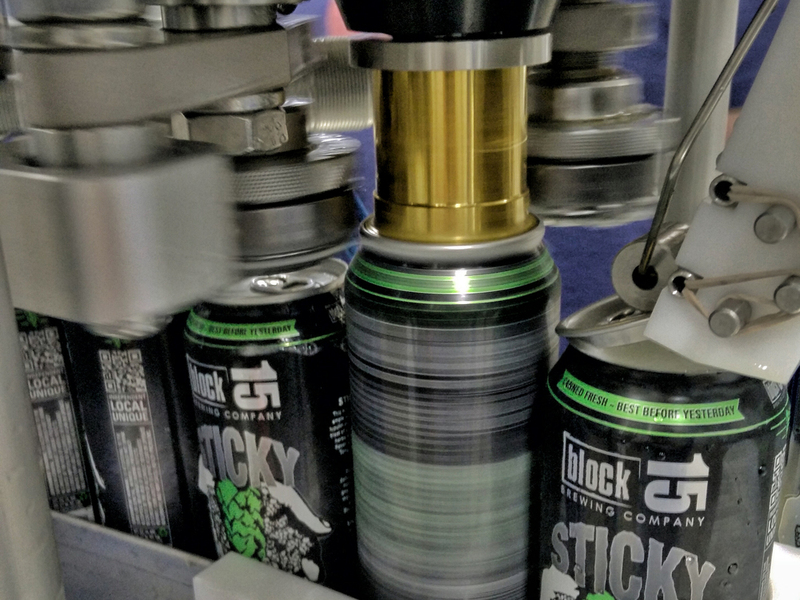 Purchase beer to go, freshly packaged at our south Corvallis brewery, including canned Sticky Hands and bottled seasonal releases—or fill up a growler fresh from the tap. For dock sales, please visit our keg sale page and pick up your beer at our tap room. SEE OUR MENU BELOW FOR CANS & BOTTLES CURRENTLY AVAILABLE AT OUR PUB! We take our footprint on this earth seriously. Breweries and restaurants often consume large amounts of resources. Through planning, training, and collaboration with sustainability partners, we're taking steps to limit waste and resource consumption. Learn more about our sustainability practices. From I-5: Take Hwy 34 west. Enter Corvallis over the bridge and proceed left at 4th Street. Take 4th Street 5 blocks to Jefferson and hang a left at the stop light. We are at the end of the block on the right at 3rd and Jefferson. From Eugene: Take I-5 directions or come from Highway 99W. This is simple – 99W becomes 3rd Street and when you see our beautiful brewing tanks on your left at 3rd and Jefferson you are here! From Salem: Take I-5 directions or come from Highway 99W heading south. 99W becomes 4th Street. Follow 4th to Jefferson Ave and hang a left. We are at the end of the block on the right. Downtown parking is free in Corvallis! There is also a free lot across the street on 3rd next to Firestone. Motorcycle parking is available at 4th & Jefferson, as well as 3rd & Adams. Most nearby sidewalks are covered by awnings, for those rainy day walks. Looking to pedal off dinner? The closest parking is at our bike racks, located 6 feet from the front door! Honest casual food—much sourced from our great state—prepared from scratch, with passion. Hand spanked Oregon Country Beef burgers, slow smoked Carlton Farms pork, unique pastas, crisp salads, beer-battered fries, vegetarian options, seasonal specials, and a whole lot more. Our kitchen is open daily at 11am, with a special Hoppy Hour menu from 2pm - 5pm and a late night menu starting at 10pm. Ask about The People's Pint to help us give back! A portion of its sales each month will be donated to a local non-profit. House-fried corn chips, melted cheddar and jack cheeses, black beans, house-pickled jalapeños, avocado, shredded lettuce, smoked tomato salsa, green onion, and sour cream. Local mushrooms stuffed with Pepper Tree sausage, cheddar, jack, and parmesan, and cream cheese. Topped with toasted bread crumbs and parsley. Artichokes, spinach, cheddar, jack, parmesan, and cream cheese. Served with house-fried corn chips. House-smoked salmon mousse, cucumbers, grape tomatoes, lemon-black pepper marmalade, fried capers, and house-baked sea salt crackers. Our hand-breaded version of the pub classic served with beer-battered fries and your choice of house-made dipping sauce. Asian-spiced Carlton Farms ground pork patty with sweet chili remoulade, pickled daikon and carrot slaw, and cilantro on a house-baked mini ale bun. House-made Freddy Guys hazelnut hummus with pita bread, feta, cucumbers, carrots, and Mama Lil's pickled goathorn peppers. Thin-cut sweet potato fries served with house made spicy tomato ranch. House-smoked chicken, spicy tomato ranch, romaine, cheddar-jack cheese, black beans, roasted corn, roasted peppers, tomatoes, and cilantro. Served with corn chips. Mixed greens, Willamette Valley Cheese Company’s aged gouda, Oregon dried cranberries, Freddy Guys hazelnuts, and rosemary-balsamic vinaigrette. Served with garlic bread. Buffalo-sauced crispy chicken, beer blue cheese dressing, romaine, blue cheese, tomatoes, shredded carrots, purple cabbage, and green onions. Served with garlic bread. Kale, baby greens, quinoa, spiced pickled carrots, radishes, sunflower seeds, greek yogurt, and roasted red pepper vinaigrette. Served with toasted garlic bread. Romaine, caesar dressing, cracked pepper croutons, ad shaved parmesan cheese. Served with garlic bread. Mixed greens, grape tomatoes, cucumbers, and carrots. Served with garlic bread and your choice of house dressing. Made fresh daily with love by our kitchen. Linguine, hazelnut pesto, sun-dried and grape tomatoes, feta, garlic, and parmesan cheese. Served with garlic bread. Linguine, house-made parmesan-garlic cream sauce, parmesan, grape tomatoes, and basil. Served with garlic bread. Linguine, house-smoked chicken, spicy chipotle cream sauce, mushrooms, green bell peppers, and parmesan cheese. Served with garlic bread. Spaghetti, house-made creamy tomato sauce, parmesan, basil, and a jumbo meatball. Served with garlic bread. All sandwiches served with your choice of beer battered fries, side salad, or a cup of soup. Fries include one sauce (additional: $.50) and can be upgraded to Sweet Potato Fries ($1.75), Garlic & Parmesan Fries ($.50), Rosemary & Sea Salt Fries ($.25), or Cajun Fries ($.25). Bourbon barrel wood smoked Carlton Farms chopped pork, Carolina-style slaw, and house-made honey-bourbon or spicy Kansas City style BBQ sauce. Served on a toasted Portland French Bakery bun. Thinly sliced Oregon Country beef round, melted mozzarella and American cheeses, grilled onions, grilled green bell peppers, and mayo. Served on a house-baked hoagie roll. Bacon, melted mozzarella, tomato, and hazelnut pesto on grilled sourdough. Chicken breast, hazelnut-basil pesto, mozzarella, lettuce, tomato, sweet onion, mayo, olive oil, and vinegar. Served on house-baked ale bread. House-made Italian style ham and sopresetta with Mama Lil's goathorn peppers, melted mozzarella, shredded lettuce, tomato, onion, mayo, olive oil, and vinegar. Served on house-baked ale ciabatta. House-made meatloaf with Carlton Farms pork and Oregon Country beef, topped with grilled onions, melted Tillamook swiss, and sweet meatloaf sauce. Served on toasted sourdough. Local shiitake mushrooms, breaded with cornmeal, fried, and topped with shredded lettuce, red cabbage, tomato, and creole remoulade. Served on a house-baked hoagie roll. Tender, thinly-sliced corned beef, sauerkraut, Tillamook swiss cheese, and 1000 island dressing. Served on grilled marbled rye bread. Corvallis’ original hand-spanked burgers, served with crisp iceberg lettuce, tomato, sweet onion, pickle, and mayo on a toasted Portland French Bakery bun. Gluten free bun available upon request for $1.50. (We are unable to guarantee that any menu item is free from gluten.) Paired with your choice of beer battered fries, side salad or cup of soup. Or upgrade to: Sweet Potato Fries ($1.75), Garlic & Parmesan Fries ($.50), Rosemary & Sea Salt Fries ($.25), or Cajun Fries ($.25). Oregon-raised, grass fed and grain finished, choice grade, non GMO, natural beef. Our house blend of lean ground turkey. House vegetarian patty with Surata tofu, bread crumbs, zucchini, carrots, garlic, sunflower seeds and herbs. Honey-bourbon BBQ sauce, grilled onions, Tillamook smoked cheddar, and house-smoked chopped pork. New Mexican fire-roasted green chilies, Tillamook pepper-jack cheese, and a mild cilantro-jalapeño mayo. Grilled sourdough bread, 1000 island dressing, Tillamook Swiss cheese, grilled mushrooms, and bacon. Bourbon grilled onions, blue cheese crumbles, and bacon. Completely Crocked kimchi, American cheese, Korean BBQ sauce, and sriracha mayo. Pickled jalapeños, grilled onions, avocado, mozzarella cheese, and spicy tomato ranch. Bacon, Freddy Guys hazelnut butter, and house-made marionberry jam. Bacon, fried egg, and Tillamook Cheddar. Wild-caught cod, fried up crispy and golden in Gloria! beer batter. Served with fries, slaw, and tartar sauce. Flour tortillas stuffed with black beans, corn, peppers, and rice and then topped with creamy enchilada sauce, melted cheddar and jack cheeses, sour cream, avocado, and cilantro. Served with corn chips and smoked tomato salsa. All of our desserts are baked fresh in-house. White chocolate meringue, blood orange curd, and topped with fresh kiwi, served with lightly sweetened whipped cream. Rich chocolate torte baked with hazelnuts and a unique Buffalo Trace single barrel bourbon, finished with a dollop of whipped cream. House baked dessert bar with toffee chunks and white & semi-sweet chocolates. Served warm with vanilla ice cream. Two warm chocolate chip cookies, fresh from our bakery. Our house made root beer served over Tillamook vanilla ice cream. Cold steeped with Holderness beans. Ask your server about today's tea offerings from Corvallis' Oregon Coffee & Tea. 2pm - 5pm | 10pm - close. Minimum (1) beverage purchase per person. In-house dining only. Discounted drink offers end at midnight. Most pints $3.75. $1.00 off of all others. Our classic combination of fresh lime juice, tequila, triple sec, and orange served on the rocks with salt. All wines $.75 off glass price and $4.00 off bottle price. House-fried corn chips with our smoky salsa. Local Freddy Guys hazelnuts, house-smoked and dusted with sea salt. Crispy wings tossed in our house spicy wing sauce and served with blue cheese dressing. A smaller version of our classic nacho plate. House-fried corn chips, melted cheddar and jack cheeses, black beans, house-pickled jalapeños, avocado, shredded lettuce, smoked tomato salsa, and sour cream. Your choice of barrel wood smoked chicken or Carlton Farms chopped pork, Carolina-style slaw, and house-made honey-bourbon or spicy Kansas City BBQ sauce. Served on a toasted house-baked mini bun. Asian-spiced Carlton Farms pork patty with sweet chili remoulade, pickled daikon and carrot slaw, and cilantro on a house-baked mini ale bun. House-made hazelnut hummus with pita and veggies. Olympia Provisions Chorizo Rioja, Tillamook smoked cheddar, house-pickled bread and butter pickles, marcona almonds, fresh baked ale bread, and our cilantro-mustard sauce. Grilled curry chicken skewers, served on a bed of coconut basmati rice with cucumber relish and our peanut dipping sauce. A hand-spanked Oregon Natural beef patty topped with house-made “Spam”, Tillamook pepper jack cheese, grilled fresh pineapple and Korean BBQ sauce on a toasted house-baked bun with all the fixings. Served with your choice of fries, soup or salad. A 1/2 rack of baby back ribs, dry rubbed then slow smoked with bourbon barrel wood for over six hours and glazed with local honey. Finished with your choice of sauce: spicy Kansas City BBQ, Texas BBQ, or honey glaze. With beer battered fries, coleslaw, and hushpuppies. Join us all day Sunday for a slow smoked chicken hindquarter and drumstick dry rubbed and basted in Kansas City BBQ sauce. Served with beer battered fries, hushpuppies, and coleslaw.